$45 - 1 hour paddling instruction for 1 person. Prices includes HST, canoe/kayak/sup and all safety equipment. Let our experienced instructors introduce you to the joys of canoeing, kayaking or stand-up-paddleboarding. This is not a course that leads to any form of certification, rather it is an introduction to learn how to safely paddle. Some of the topics covered: paddling techniques, embarking and disembarking from a dock, steering, falling out of a canoe or kayak. 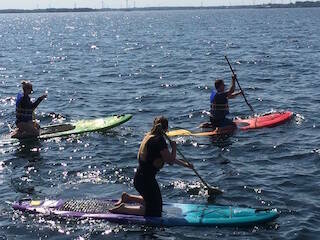 Reservations for paddling instruction require full payment via our online reservations system. No refunds for cancellations within 48 hours, a 25% fee will be applied to cancellations greater than 48 hours. Instruction will be cancelled or postponed if weather conditions are unsafe. In this case, full refunds will be given.